Hard Bound | 445 pp | size: 9.3" x 7.7"
ISBN# 978-0878576999 Rodale Press Inc. 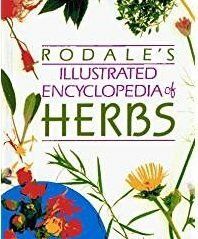 True to Rodale's reputation, this reference book is thorough and fully illustrated with black-and-white sketches of individual plants and color photographs. More than 140 herbs are identified from A-Z and each includes plant history, application, as well as cultivation. Additional chapters detail the use of herbs for bathing, dyes, gardening, cooking, healing and cosmetics. Because we believe this is such a good book for any herbalist's library, it is offered here in good, used condition at an affordable price.